Ever thought what happened if you boils some cold drink ? Here is a such type of experiment video which amaze you what happened to the Pepsi after boiling it. This reaction would be same with all kind of cold drinks. 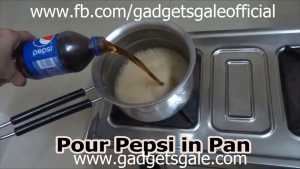 Watch the video of “Boiling pepsi” directly from below or you can also watch it on our youtube channel from bottom of the page link. If you liked this experiment share this with your friends.